This week, because I have vacations on the brain, we’re making one of my favorite travel-friendly foods: Spicy Spam Musubi with brown rice. Whenever I travel, I have a few rituals I like to follow. I pack a soft scarf in my bag, tuck earplugs into my pocket, and I always, always have to prepare what my husband calls a Plane Picnic. Plane Picnic involves an assortment of portable foods that can be squeezed into my over-full purse and sit at room temperature for hours before being eaten. Ideally, there would also be a variety of snacks to alleviate 10th-hour boredom, including salty, crunchy things and a sweet treat or two. But the most important component of Plane Picnic, the one that requires the most planning, is the main course. 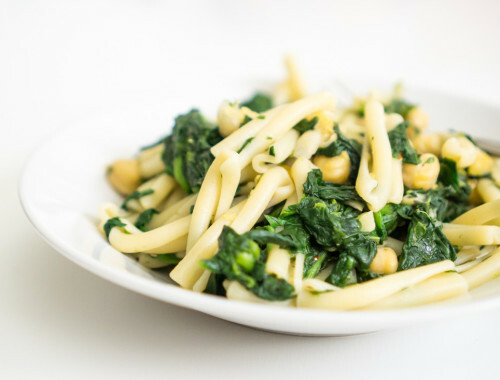 Besides meeting the above requirements of compactness and ability to stay fresh at room temperature, the main course must also be filling, nourishing, and not too heavy. The main course should also not be odiferous or too messy to eat, or else you might incur the wrath of your fellow passengers. Spam Musubi perfectly fits the bill. Say what you will about the preservatives in Spam – if there’s ever an appropriate time to eat shelf-stable Spam, it’s when you need to pack a Plane Picnic. (And although I don’t actually recommend keeping it out for hours, I’ve done so without any ill effects.) And what also makes Spam Musubi perfect Plane Picnic food is the fact that you can throw it together relatively quickly, as long as you ensure that you have cooked rice on hand. First, lay out all your ingredients. I live next door to a Japanese $1.50 store (Daiso, to be specific) that sells Spam musubi makers for $1.50 each! But if you don’t have a musubi maker, feel free to shape the musubis with your hands. An oblong, Spam-sized shape for the musubis would be nice. 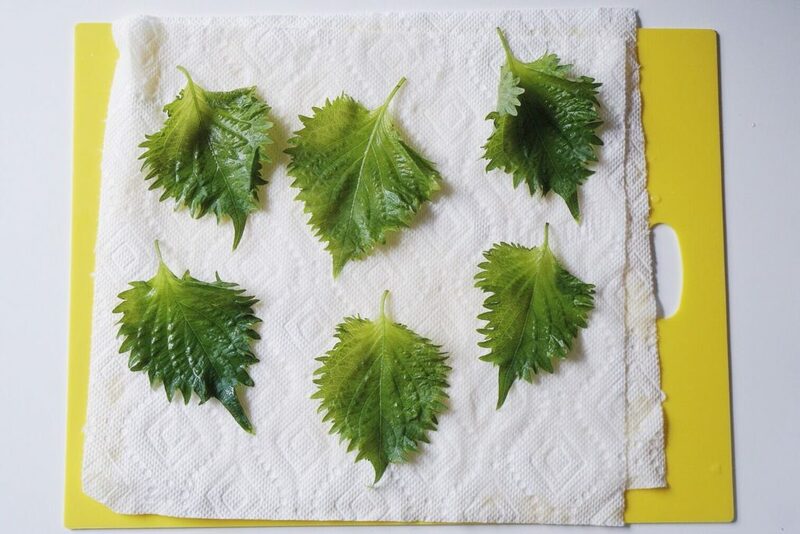 Wash and dry the shiso leaves. Shiso is not necessarily traditional in Spam musubi, but it adds a nice peppery, fresh flavor to the rice balls. 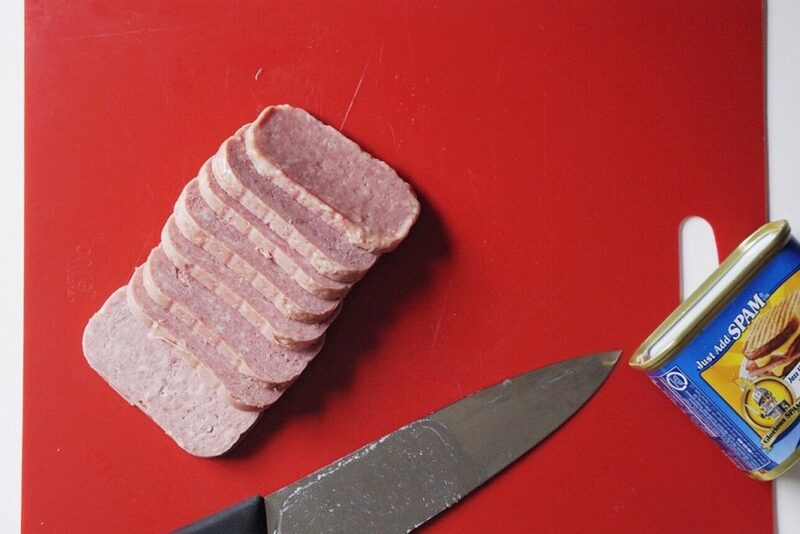 Slice your can of Spam. 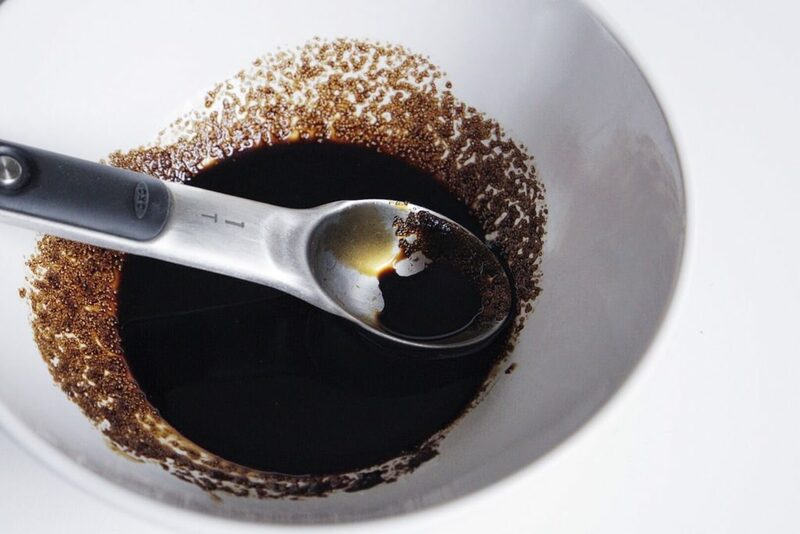 Prepare your glaze by mixing soy sauce and sugar. Because my soy sauce is quite salty, I like a proportion of 3 tsp. sugar to 1 tsp. soy. Play around with the amounts until you get the taste you like. Pan-fry the spam slices in a single layer and flip. Drizzle the Spam with the soy-sugar sauce and continue frying. 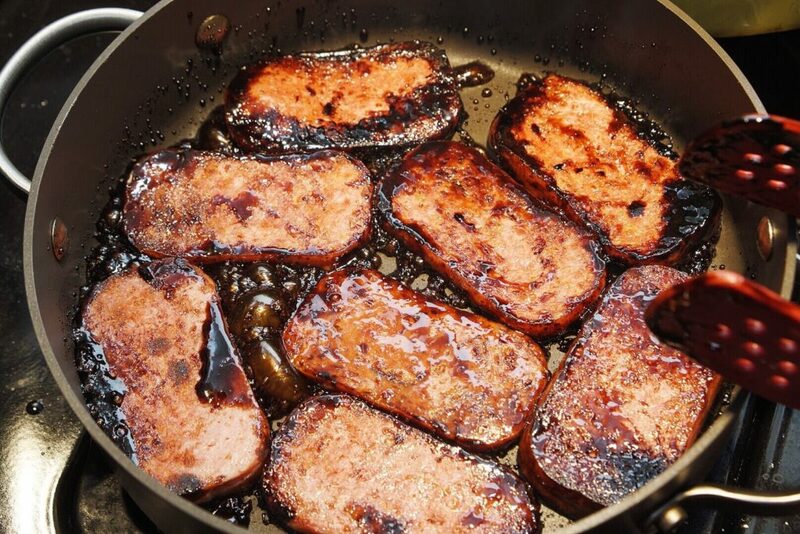 Cook the Spam until you get the level of crispiness and caramelization that you desire. 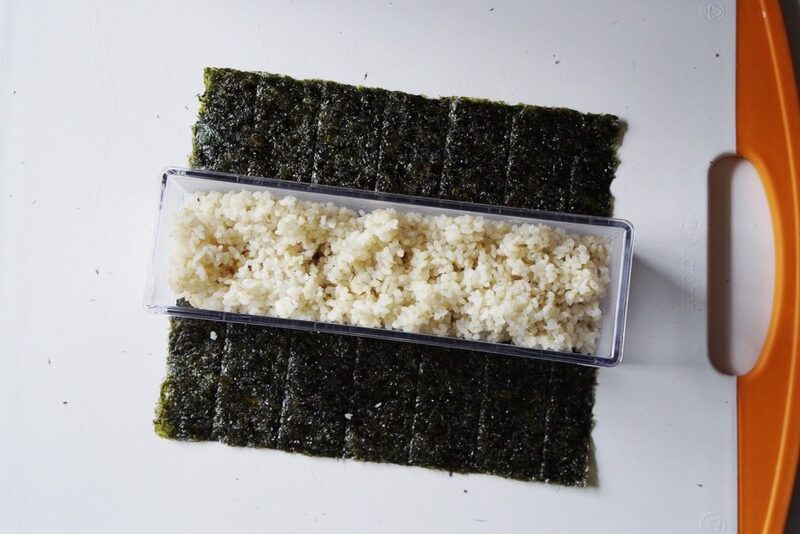 On top of the tightly-packed rice, sprinkle the furikake (nori-sesame powder) and shichimi togarashi (a spicy mix containing red chili peppers). Top with the Spam slices and then add a layer of shiso leaves. Add more rice and again press down firmly. 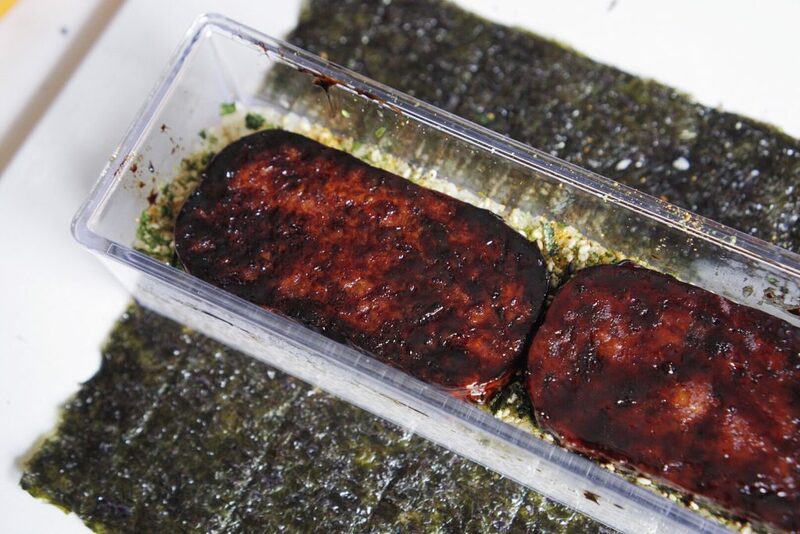 Remove the musubi from the mold by pressing down firmly and easing the musubi carefully out of the mold. Wrap the ends of the nori around the musubi, adding another strip of nori if necessary to fully wrap the bar of rice. Slice, then wrap tightly in plastic wrap for your Plane Picnic. Or eat it immediately! 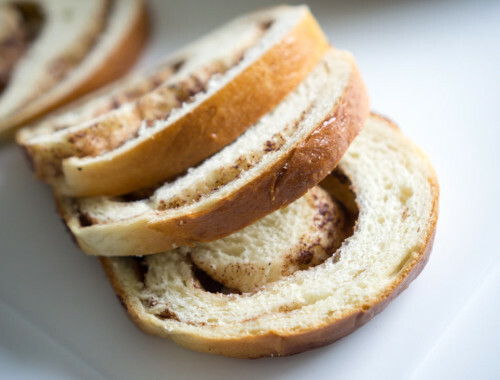 With this recipe, you’ll never have to go hungry while flying or eat bad airplane meals again. Happy travels! Mix sugar with soy sauce. Slice your can of Spam into eight or more slices. Pan-fry in a nonstick skillet for about 2-3 minutes until it starts to brown. 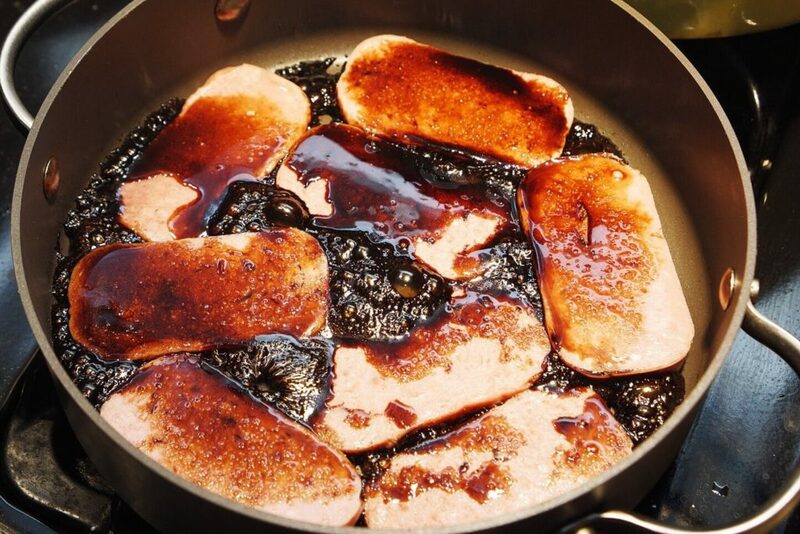 Flip the Spam and drizzle soy sauce-sugar mixture on top. 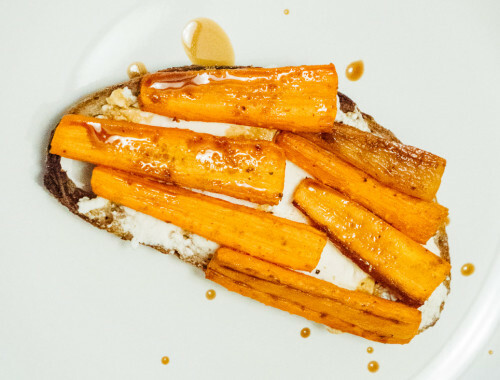 Continue to pan-fry until it reaches your desired level of caramelization and crispness. 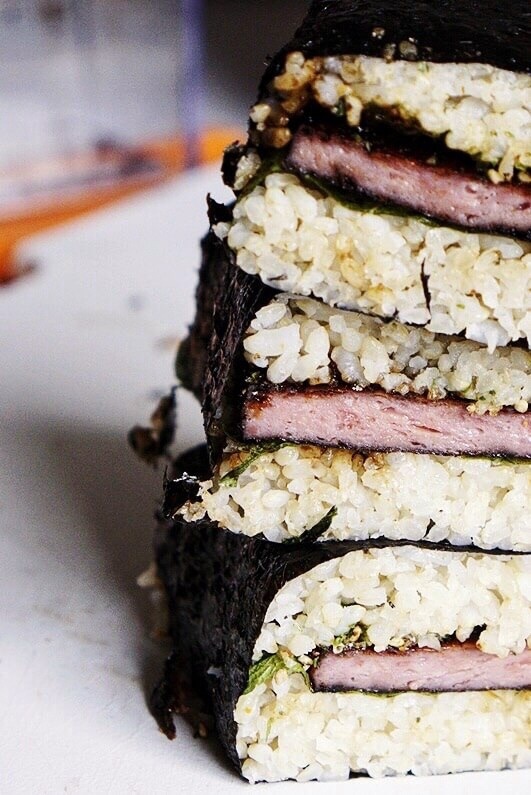 Place a sheet of nori on a prep board and place your Spam musubi maker on top. 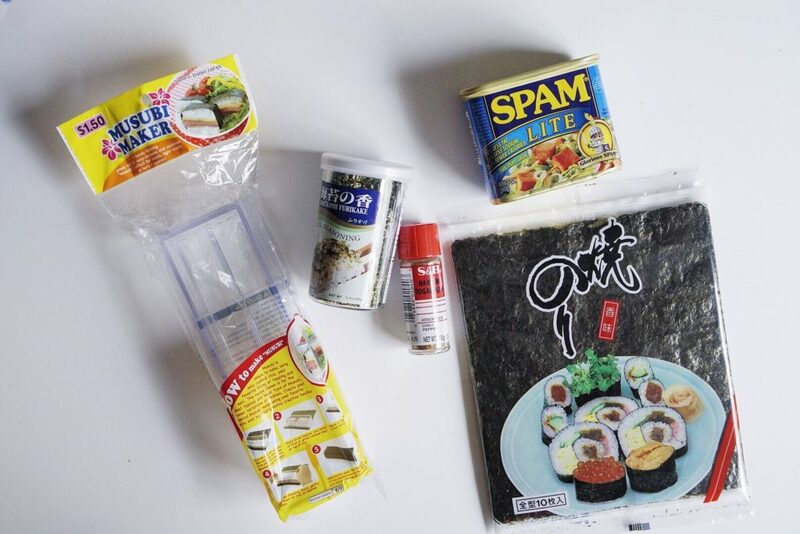 (If you don't have a Spam musubi mold, simply shape the rice by hand into oblongs, top with shiso leaf and Spam, and wrap with a sheet or thin strip of nori, depending on how you want your Spam musubi to look and taste. 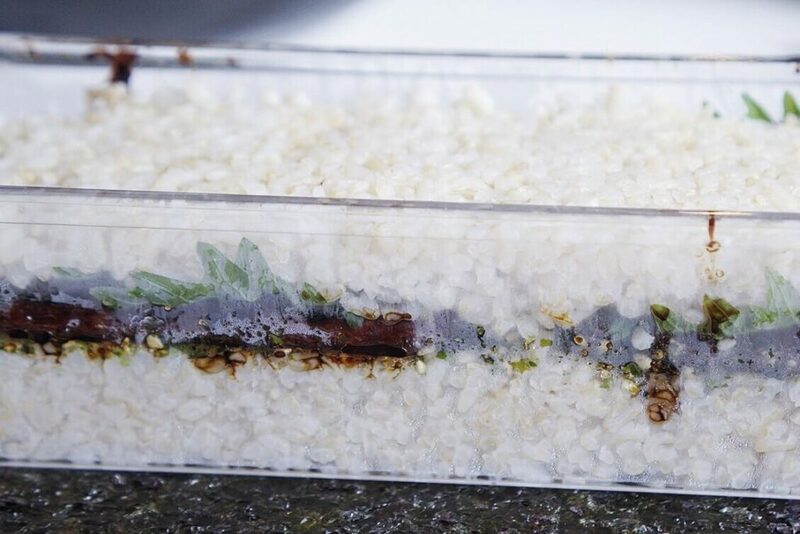 Fill your mold with rice and press firmly with musubi mold lid. This is important - if you don't pack the rice firmly enough, your musubi will fall apart. Add more rice and pack until the mold is about 1/3 full. Sprinkle rice with furikake and shichimi togarashi and top with Spam slices in a single layer. 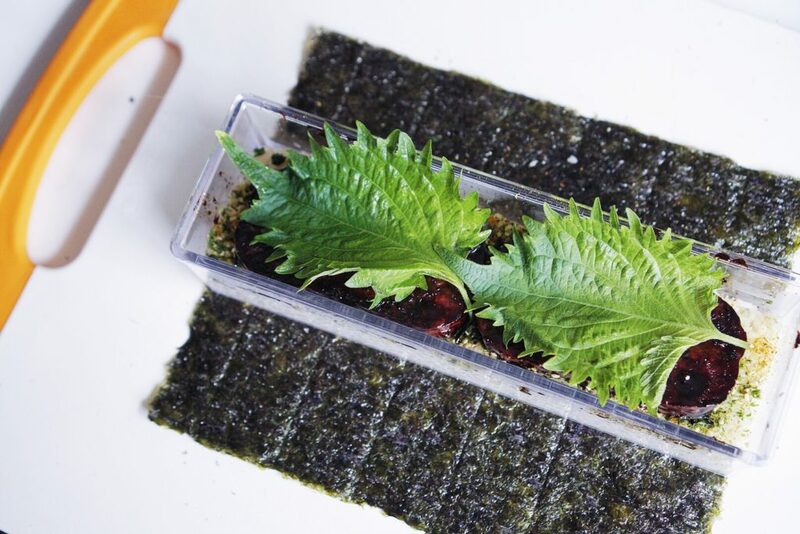 Add shiso leaves in a single layer. Finally, top with more rice and press firmly. 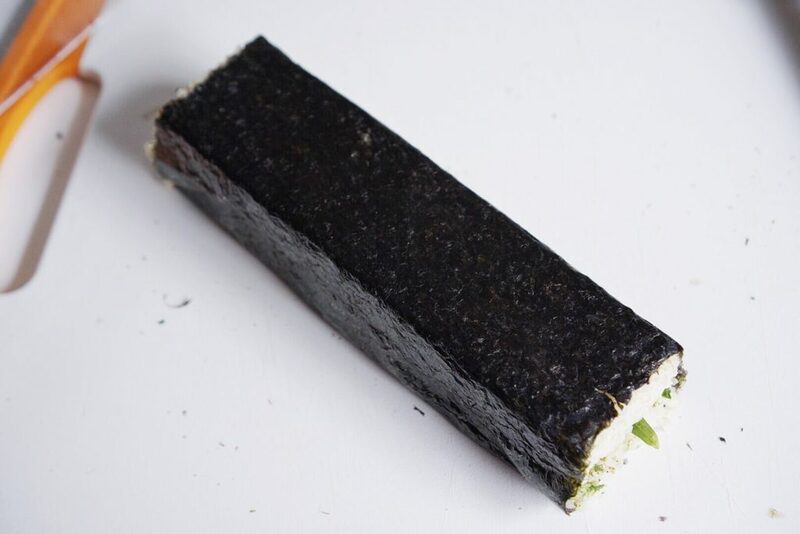 Remove musubi from mold and wrap with overhanging nori. Slice and eat.